Recently I ran into the ‘problem’ of SSRS not being able to easily show running totals in the footer AND header of a invoice. (carry forward amount). After some digging and experimenting, I created a solution that worked for me. We are running a SQL 2012 server with SSRS 2012 on a Microsoft Dynamics AX 2009 database. 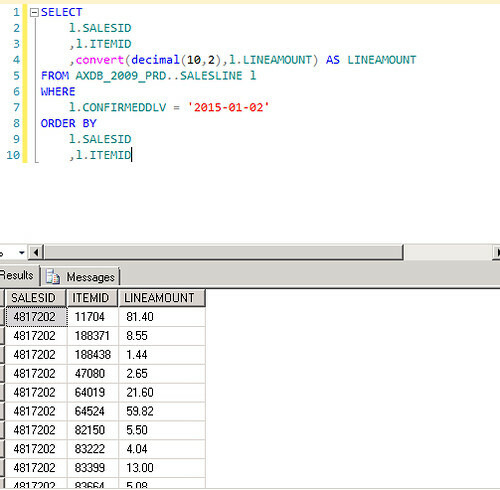 Returning all salesline rows from a given date with salesid and itemid. We would like to have a page header, showing a ‘carry forward amount’ (from all previous pages) AND a running total in the page footer from this and previous pages. There is one tablix with three visible columns. I’ve also added a total, by right clicking on the details group below and choose Add Total. Next there are four textboxes that have some expressions that I would like to explain. Fields 1 and 2 are in the tablix itself and will be hidden in the final report. The first one is for the calculation of the actual ‘running total’ for the footer. I’ve given this textbos the name ‘RunningTotal’ by right clicking on the textbox and selecting Text Box Properties. The second field in the tablix (also to be hidden) calculates the ‘previous’ running total that will be used in the header. This will tell SSRS to select the last row (of that page) and get the value from the textbox with the name RunningTotal (nr 1). 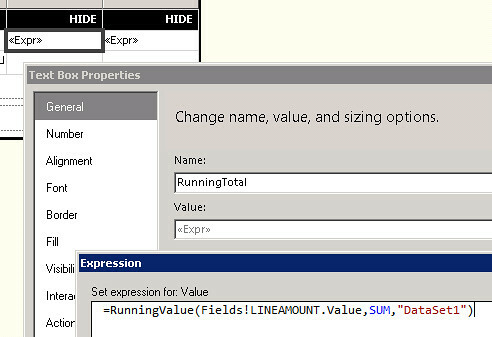 This will tell SSRS to select the first row (of that page) and get the value from the textbox with the name RunningTotalHeader (nr 2). Notice the carry forward in the header has the same value as the footer had from the previous page (just how we wanted). We will do something similar to the last page footer. As with most of the SSRS challenges, using some creativity can solve many problems. This one worked perfectly for me, but if you have more to add, just reply to this post and I will try to help! I have a question (problem) and I hope that you can help me. I want to set the text box (3,4) in to the grid not let it on the header and footer like you. So it raise and error and can not deploy. What do you mean by ‘previous page’? Are there more pages before the ‘previous page’? Do you want the running total on the first row in page 3 be € 200,- or € 300,-? Ok, should be possible with a similar solution. Just create a running Total like I did and refer to it with reportitems!…. in the first row of a table. I will give it a try tomorrow if it won’t work. Of course this is possible. With some referring to reportitems you can achieve this! I made a new post showing how you can do it. Hi, Thanks for the post. It really helped me. Ok, what version of SSRS are you running? Thanks a lot for providing solution. On the similar line I got report where I have to show and carry forward total in footer and header respectively, but number of columns are around 23. 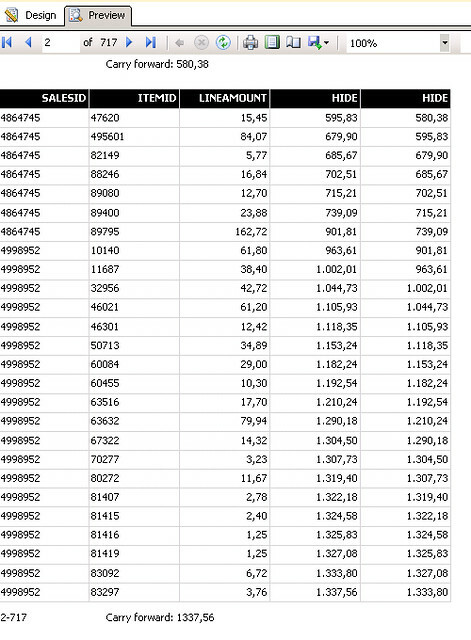 Now for that as per your way do I have to add 23*2=46 hidden columns more in the tablix? Is there any shortest way as my report is itself horizontally big that is A3 paper size report. I think that is one solution indeed. But you might also wonder why you need 23 columns on one report…. But then again, maybe I’m too much used to KISS…. 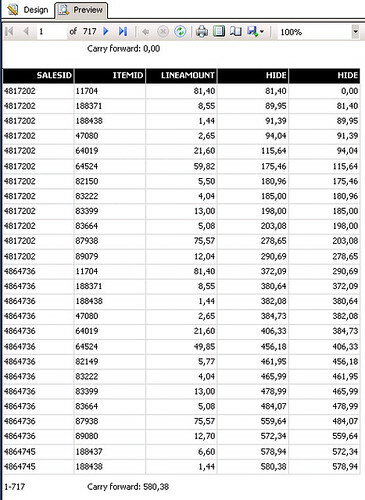 Hi, I am having an issue, I can export the report in pdf as long the column / fields 1 and 2 are visible , but if I hide these columns, I get error when I try export in pdf as follows (Please note : the report displays on the screen correctly but throw error at the time of export only. I am using Dynamics 365 update 22 and Visual studio 2015). Sorry, the server has encountered an error. It is either not available or it can’t respond at this time. Please contact your system administrator. That one is hard to reproduce for me. But I’m not sure if that is the reason for me not having these issues.